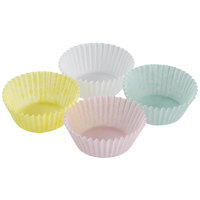 The fluted edges of our yellow cupcake liners give baked goods a familiar ribbed base, and each cup is made specifically to peel away without sticking to the product or tearing it. They can withstand high heat in your oven, and they're disposable for added convenience. Use them to coordinate a themed party, wedding, or event as well! The yellow color will look bright and cheerful on dessert tables at catered events. These yellow cupcake liners add extra color to your dessert presentation and make your display case look happy and festive. Because these cups are packaged in bulk, you can also be sure that they'll arrive in large enough quantities to reduce your amount of repeat purchases. Be sure to use our muffin pans and aluminum foil muffin pans to bake your treats, and make each one unique with our assortment of baking toppings. If you're wondering where to buy yellow cupcake liners, we have a large selection of yellow cupcake liners for sale at the lowest prices.